It’s Cinco de Mayo and a beautiful night to eat under the stars. Not being a seasoned cook of Mexican dishes, I turned to one of my trusted sources for enticing recipes, The Frugal Housefrau, who from the name of her blog you would not suspect her to be a master of Fiesta Cuisine. Trust me, she is! 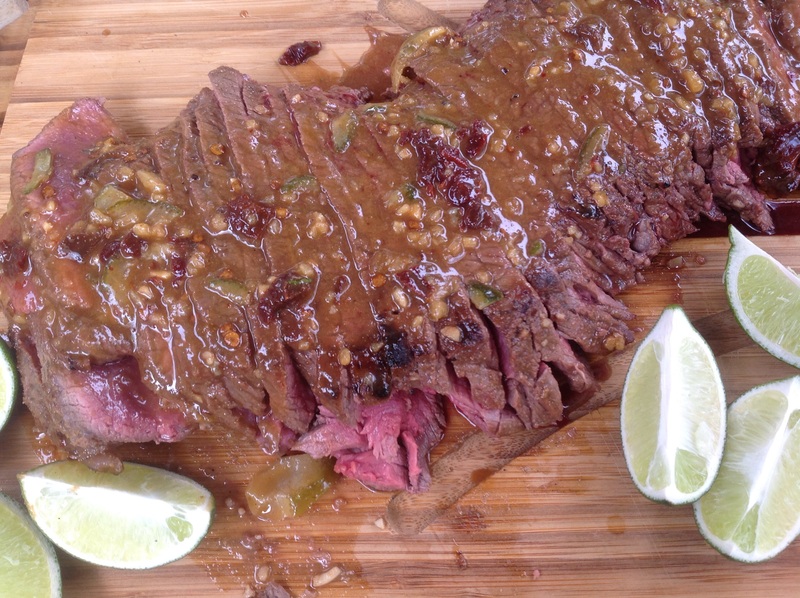 This recipe is great with a cheaper cut of beef because it is tenderized with a marinade. It is ideal with flank steak, top round or New York strip. One large steak is grilled then sliced for the table. Wih a double layering of flavors from first the marinade then a glaze, this steak packs a powerhouse of seasoning. Ours was served with a Mexican rice with corn and cilantro and a salsa of black beans, tomatoes and avocado(recipe follows). To see the original recipe, please click here. Mix all ingredients and marinade the steak for 1-4 hours, turning occasionally. Bring to room temperature for 30 minutes before grilling. 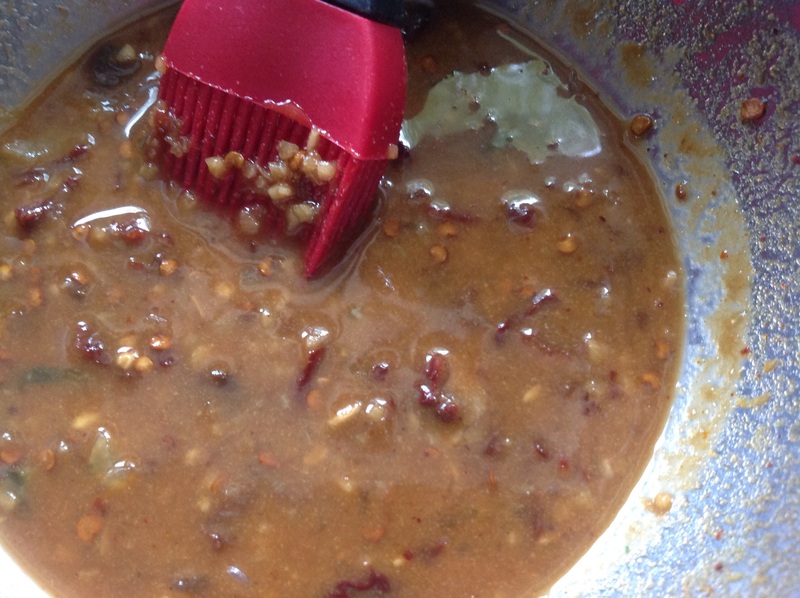 Discard marinade. Mix all ingredients together( can be made ahead up to 2 days). Preheat grill to the hot setting. Brush each side of the steak with the glaze, reserving some for the finished steak. Grill the steak on each side for 3-4 minutes for medium-rare temperature. Rest the meat under a tent of foil for 5 minutes before slicing on the diagonal. Serve with extra lime wedges. My glaze did not caramelize as much as the original. We grilled on medium and it was not hot enough. If your glaze tends to be on the runny side as mine was, bringing it to a quick boil would thicken it more to the consistency of a BBQ sauce. It was still really delicious and flavorful. Mix all ingredients together. Serve with chips or as a side salad for a Mexican themed meal. 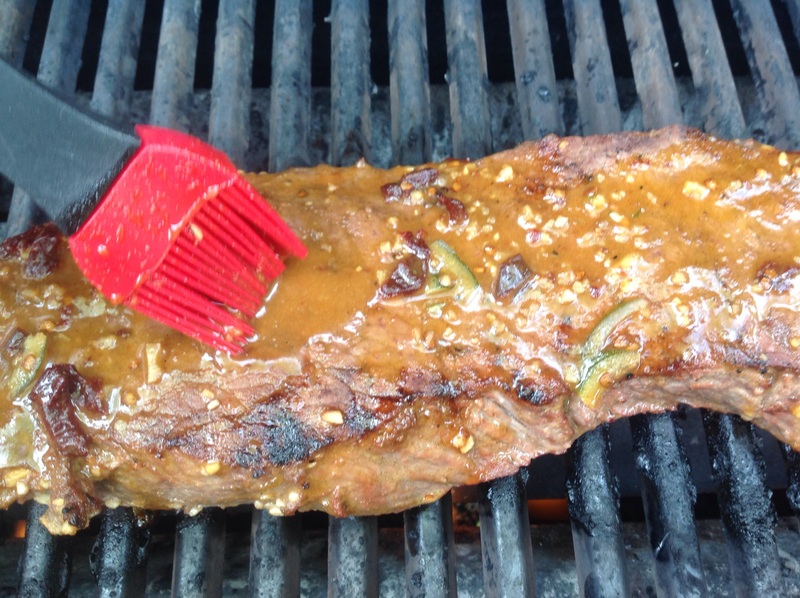 This entry was posted in Recipes and tagged black bean avocado salsa, Honey chipotle flank steak by Johanne Lamarche. Bookmark the permalink. This looks beautiful! That picture on the grill?!! 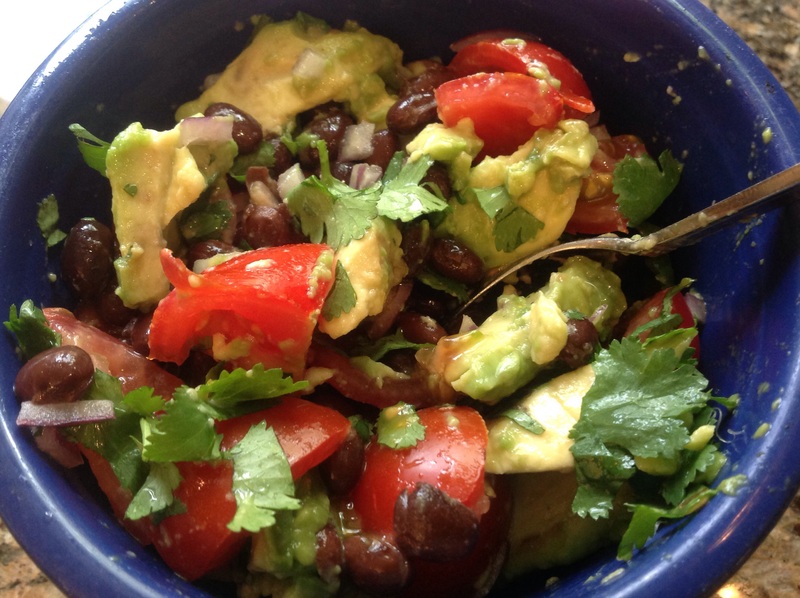 I love the Black Bean Avocado Salsa, too, and can’t wait to try it. The “glaze” is a bit runny, although I have noticed that I usually make it ahead and it sits in the fridge for a bit. The honey gets a little thicker when it’s cold. Interesting thought about turning it into a bbq sauce! I might have to play with that this summer! The honor was all mine! My gang loved this so much! I was rushing to make it tonight but cooling it would work to thicken it. We had bought the steak at Costco and it just melted in our mouths. About $12 for 6 portions so not bad FH! Good work; I am debating about Costco right now. I buy my prescriptions there and get great deals!! The meat is the best part of Costco! Try their boneless short rib steaks. Need to be grilled on all 4 sides as well as the front and bavk. Our favorites and much cheaper than rib eyes but just as tender with no waste. Love the citrus marinade and the honey chipotle glaze! All the credit goes to Frugal Hausfrau for the ingenious combination. It was really good and very different for my family. I usually do citrus with poultry or seafood. This steak does look melt-in-your-mouth delicious! What a great day for Mexican food lovers like me. This looks extremely inviting! Not surprised since it came from Ms. Hausfrau. She’s got some amazing recipes, hasn’t she? You should try her hash brown omelette. I’m looking for your Pinterest link in here, where is it? Thanks Angie. Our Hausfrau sure treats us to some great recipes! And she always takes time to write thoughtful comments. Love her!